This Dish looks similar to Stir-Fry Stink Bean with Shrimp, but it is not stinky or bitter at all! 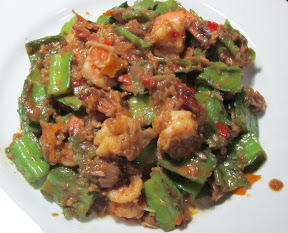 Fresh green winged beans are crispy and taste wonderful with the shrimps. This is another alternative of what you can do with winged beans. Hope you like it. First make the paste by adding garlic, shallot, lemon grass, chillies and shrimp paste together in Mortar and beat into paste. Heat the wok, add vegetable oil and fry the paste for a few minutes with medium heat, add the shrimp and continue frying until the shrimp turn pink and only half done. Add the pieces of winged beans to stir-fry together and season with soya sauce. Continue to fry for a few minutes and turn off the gas. Tip: the shrimp paste contains salt in itself. Some brands are more salty than the other. Be careful of the use of salt here. If you don’t like the shrimp paste, you can also reduce or remove it from the paste.